Looking to buy a rv? RVParkStore.com has 103 rvs near Mentor. It's the best of both worlds! You can use this hybrid park model as a travel trailer, or set it up on a lot and use it as a park model. It comes with a nice spacious floor plan, and even includes a washer and dryer! 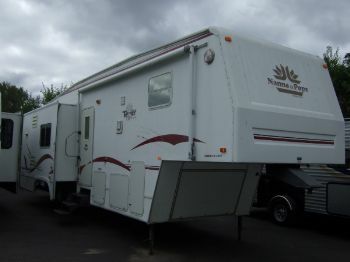 Very nice well maintained Terry fifth wheel. You will enjoy the nice open floorplan and the low price! Here is a beautiful destination trailer from Heartland! Just picture yourself at the lake relaxing in the spacious living room. The bedroom is equipped with a king bed and huge walk in wardrobe. This is one great couples trailer. The huge slide makes for a great open living space! 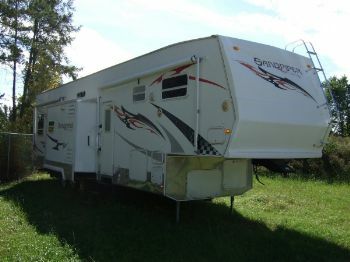 Here is a great fifth wheel with a bunkhouse to sleep the whole family. It also boasts a spacious living room and kitchen area with center island. Plus if the weather is hot, you can do your cooking outside with the pull out kitchen! Great single axle. 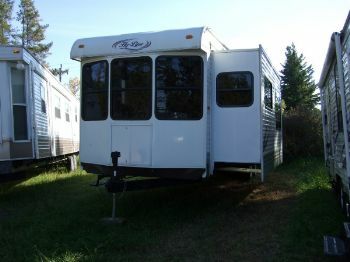 This one has a queen bed and bunks so you and the family can get out camping in a machine that weighs in at 3283 pounds! This unit is sold, but please contact us as we have another on the way. Come check out this fantastic floor plan from Heartland! It has two slides and a center island that allows for a ton of living space and counter space! Here we have a lightweight single axle with a queen bed. And unlike most trailers this size, you can get off of either side of the bed so you won't disturb your sweetheart! Couple this with a roomy bathroom and you have one great camper!!! Here is one excellent half ton towable fifth wheel from Sedona. Three slides make for a very roomy trailer. Stop in and check it out today!